Daisy the Curly Cat: Aloha nui loa! You MIGHT remember that DAISY got to be on a HALLMARK card wearing this outfit. So I been THINKING, this must be a GOOD outfit. To EVERY card company, I would make a good CARD, too! Do you want to HIRE me? It is EASY to model real GOOD in this OUTFIT! Because it is COLORFUL! And it makes CRINKLY noises when I move. Um, is this how you are SUPPOSED to wear a coconut bra? That part is CONFUSING. You look very dashing Harley! and forget about the bra. They are for girls. You're a boy so you don't need one! You look great Harley. Don't worry about the coconut bra, you're probably better off without it. We would buy a card with you on it. Rocka-hula my friend!! You got style! Hakuna Mattata! You look FAB! We like the 3rd picture the best, but all of your pictures are PURRific! Dude, you deserve your own card and poster too. Great pictures even without the coconut bra! Harley, you are so dashingly good looking! We bet Hawaii would love to have you be the Official Spokespurrson for their entire Tourist Bureau! Can you play the ukulele? You can replace Don Ho... Harley Ho? Harley Hi? Harley Hawaii? Lovely outfit Harley! I'd skip the bra, though. Oh, that's a winner alright, Harley! Good luck. If you had the operation...you won't need the coconut covers :). Well it's not as manly as your toolbelt but I think you could definitely be a card star like that. 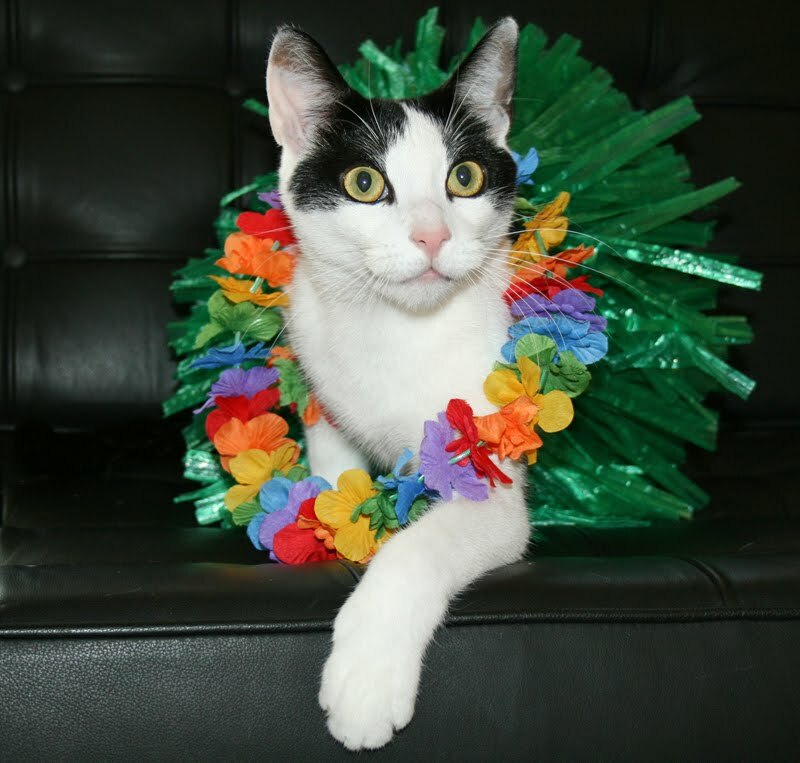 You look adorable Harley and Mommy would love a card with your picture on it, but we thinks you should leave the coconut bra off. 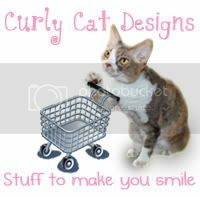 We'd love to buy cards with you on it! you would make a great card Harley! We would certainly buy a card with that picture of you on it. Who cares about the bra part. You don't need that anyway. Tell Mommeh to save this picture for next year's calendar. You are looking good Harley. Good job of modeling. Harley, you look very colourful! Fabulous! Harley, we hope you make it onto a Hallmark card, too! I loves a mancat who is not afraid to explor hims feminine side! You looks really nice Harley. Your mommy takes such nice picshurs. We buys a few Daisy cards, I thinks we would buy some Harley cards too! Has a grate weekend my friends! not many guys could pull off the coconut bra look but you my friend, have done it. yes you are adorable harley. in a very manly way that is! You've got me all confused, Harley! Oh Harley!! We don't think the grass skirt was made for you! Maybe you should try those coconuts on your ears!! Harley, yoo are a really super model. If they don't hire yoo, they are silly, or even worse! PS: we don't fink yoo need the coconut bra bit! Tell Daisy yes, the lamb treats are delicious! A bit more chewy than the liver but very yummy. i think you lool excellent, harley. i would hire you for my greeting card. Any card company would be lucky to have such a colorful mancat. I think all the pictures are good but like the third one best! I must say that in that second photo you looked quite dashing! Oh I LOVE you Harley!!! We are sure that you are gonna be the hot model for the card!!! Every card company should call you immediately!!! We didn't know about the DAISY card and we are so thrilled!! You 2 always amaze us!! Oh Harley you look adorable in that skirt - its colours show off your furs. We don't think you need to wear the bra cos you've got nothin to hide. I am not sure you need the coconut bra Harley! 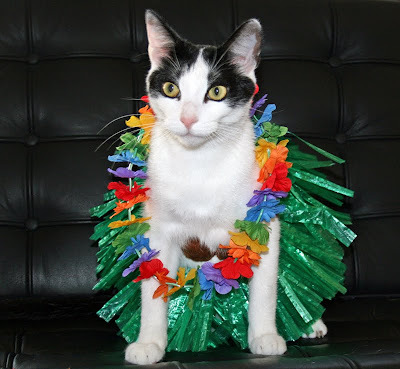 I think just the skirt and lei are great on you--they show off your tuxie colors nicely. I think the coconut bra goes on your head. You know, like ear muffs. Oh, Harley, how do you manage to look beautiful AND manly? And, no. I do not think that is how you wear a coconut bra. I think all the card companies will hire you without it, tho. you look faaaaaabulous, dahling!! we say ditch the bra, too. but that third picture--heck, we'd buy ANYTHING with that picture on it! you da bomb, dude!! I just used my last Daisy card... need to hit walgreens to get more. You should totally go for it! Model your little heart out for the card company. As for the bra...eh...if you leave it on you can work for the TransCat community, as well! MOL! I especially love the second picture. I would buy that card! 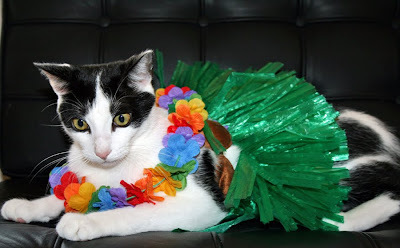 You look very nice in your Hawaiian getup. 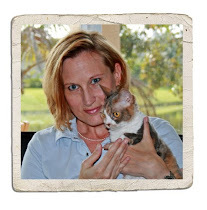 Also, thanks for running the ad for my new book, The World Is STILL Your Litter Box, on your blog... I really appreciate it! Very colorful! You'd make an excellent card Harley! We has no idea about the bra part though. Those colors really look nice next to your ManCatly black and white furs! You're turning into a great model. Hmmmm...yes that bra does seem to be a bit tight on you. Must be all those Mancatly muscles you have, Harley! I think yoo look really good, my sisfurs was laffing tho, dey sed da bra was on backwards. I don't know dat yoo even need a bra. Maybe yoo should do what our dad did and just wear it on yoor head. I think your picture would be perfect on a card! You do look great in that Harley! We would just leave the coconut bra off, it must be uncomfortable! Harley, you don't need to be a copycat! You are an original, so you should have your very own hula skirt and coconut bra. I'm sure Hallmark would love you. You're a real card Daisy. And we don't know how you do it. Wearing a skirt like that and not attack it. It looks like a great toy. 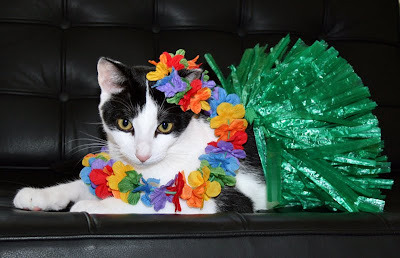 Aloha, Harley! I was just thinking about how it was REALLY hot outside here today, and so it seems like you are all ready for summer to match the weather! You would be so cute on a card! Harley you could star in South Pacific! MOL hehehe Yes I remembers how Daisy was on da card Harley, you looks very good in dat outfit as well. I don't finks you supposed to wheres da coconut bra though! Skip the bra and get a surf board instead Harley!! Harley, I think #2 would be awesome for a postcard party invitation! Wear it, weat it wear a coconut bra Harley! Make a great revolution like Coco Chanel! I think you managed to pull it off totally Harley! Hi! It's me again! 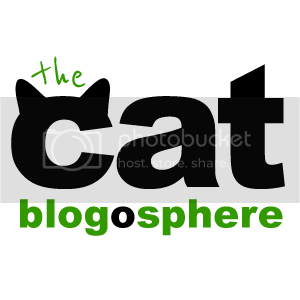 We just wanted to let you know that we have an award for you on our blog today! Now Harley! That outfit might look good against your furs... but are you sure that it is your style!?! Goodness Harley, I would hire you if I was a card company. You look great in that outfit too. It is very colorful. I really don't think you would have to worry about that coconut bra though. Rock-a-hula on Harley. Harley is a coconut! he he. Aw, Harley you look very bright and cheerful in that outfit! And you pose so nicely... must be taking lessons from Daisy!